Kapila is the daughter of Mohiniyattam danseuse Nirmala Paniker and Kutiyattam exponent Gopalan Nair Venu.She is the disciple of legendary Kutiyattam maestro Guru Ammannur Madhava Chakyar. She has also trained in Kutiyattam under G.Venu and Usha Nangiar and is presently training under Kitangur C N Rama Chakyar. 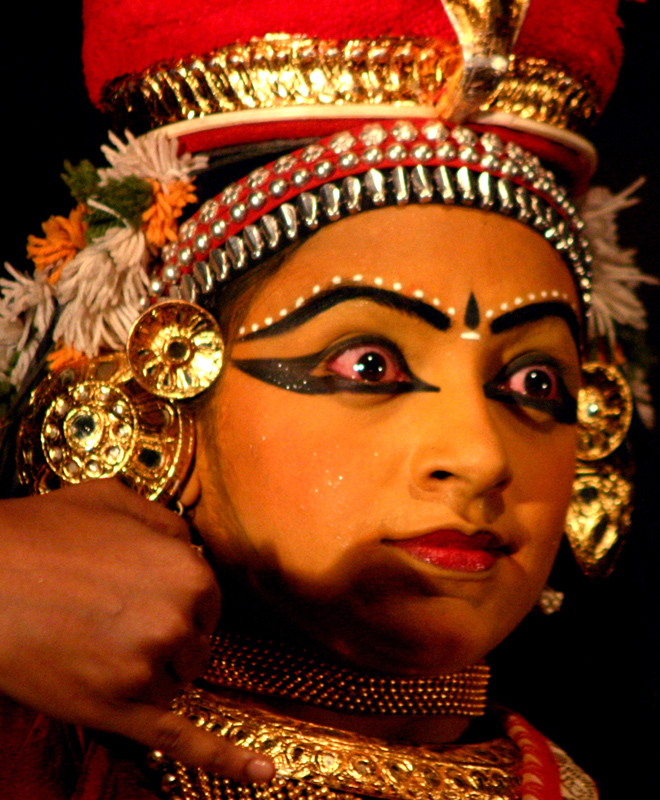 Kapila has been active as a performer of Kutiyattam since a young age. Her repertoire comprises both traditional performances and new experiments. She has traveled with her performances both as a solo performer and together with the Kutiyattam ensemble (Natanakairali and Ammannur Gurukulam) performing and giving workshops in a variety of venues. She aspires to explore the depths of traditions and at the same time find other than the regular possibilities, spaces and people for her art. Trained in Kutiyattam since the age of seven for several years in Gurukula Sampradayam under Late.Guru Ammannur Madhava Chakyar at Ammannur Chachu Chakyar Smaraka Gurukulam, Irinjalakuda. She has also trained under G.Venu and Usha Nangiar. Presently undergoing specialised training with Kitangur C.N.Rama Chakyar. Trained in Mohiniyattam under Smt.Nirmala Paniker. Participated in Hastha(gesture) and Nethra(eye) workshops organised by Natanakairali and Sanskriti Pravah, New Delhi with support from Japan Foundation- 2004,2005,2006. In these workshops indepth reasearch, training and documentation was done for three years with great masters of Kutiyattam(Ammannur Madhava Chakyar, Ammannur Parameswara Chakyar), Kathakali(Late.Keezhpadam Kumaran Nair, Late.Kavungal Chathunni Paniker, Late.V.P.Ramakrishnan Nair, Sadanam Krishnan Kutty, Kalamandalam Raman Kutty Nair), Yoga, Aayurvedam, Sidha Vaidyam, Tantram and other Asian performing traditions in relation to hands and eyes in Asian performance and related fields. Kapila is a permanant member of the acting laboratory and a participant in all workshops and ongoing activities. Participated in The World Theatre Project workshops which were interactive workshops lead by renowned theatre practitioners Peter Oskarson, Ma Ke, Manuela Soneiro, G.Venu, Donato Sartori, Inger Zielfelt, Henning Mankell, Anna Thelin and performers/actors from various cultures of the world including Sweden(Contemporary western theatre), China(Beijing Opera), Mozambique(African dance and theatre) Italy (mask theatre). Kutiyattam is a theatre form that has the richness and depth acquired from an ancient history and a long and unbroken performance tradition of more than 2000 years. Koothambalam meaning ‘temple for theatre’ is the exclusively designed venue for the performance of this unique theatre. Actors(Chakyar and Nangiar), musicians, costume and stage specialists(Nambiar) come together to realize the performance.Performances are usually based on Sanskrit texts and their elaborate interpretations and dramatisation. The actor reigns in Kutiyattam. The ‘performance space’ and ‘performance time’ sets free a well trained actor like a bird to explore the sky. The actor is followed by the acompanying Mizhavu (pot drum) that breathes life into every pulse, movment and emotion. The craft and techniques of acting are a blend of both elements – high stylisation and folk (daily, rustic, worldly). The actors and musicians undergo several years of intense training and conditioning to master the complex techniques and skill and simultanoesly acqiure the capability of having the altered existence onstage. Performances can hardly be time bound. The presentation of a single act of a play can go on for several days and nights, moments can be frozen and explored for hours in an almost meditative relationship between actor and sahrdya(one of good heart, spectator). The theatre style embraces south India’s indigenous culture of conception and representation as well as the acting technique described in Bharatha’s Natyashastra, the treatise on Indian dramaturgy. Therefore it internalizes both the rigour and vitality of all the folk, ritual and martial arts together with the concepts of classical Sanskrit theatre in India.